In the left panel of Server Manager, select Local Server. If IE Enhanced Security Configuration is On, change the status to Off. Next to XenApp, select Start. At Licensing Agreement, select I have ready, understand, and accept the terms of the license agreement and select Next. At Core Components, select Next. At Firewall, select Automatically and select Next. At Finish, tick Open the StoreFront Management Console and select Finish. In StoreFront Management Console, select Create a new deployment. At Base URL, create a URL for your StoreFront. 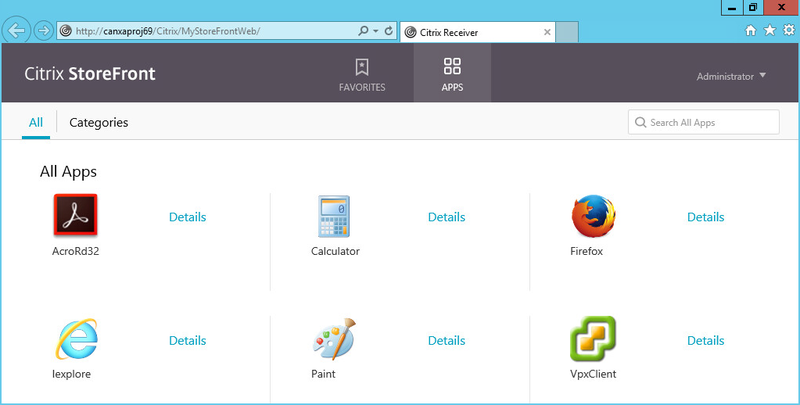 This will be the URL clients go to to start Citrix Receiver. Select Next. At Store Name, give your StoreFront a name, such as MyStoreFront, and select Next. At Delivery Controllers, select Add, select Add again, enter the hostname of your Delivery Controller, and select OK. Change the Transport Type to HTTP and select OK. Select Next. At Remote Access, tick None and select Create. Make note of the URL and select Finish. Enter the StoreFront URL in a browser on the Virtual Machine. Sign into the StoreFront using the Administrator account. In this example, a few applications are available in the StoreFront.